Aarsun Woods present you with Handcrafted Partition Screens / Wooden Room Dividers made from Mango wood and adding a touch of elegance to your living room. Folding Partitions are mostly used to separate a space from the rest of the house. It can be used in Puja Room or as a Privacy Screens. Moreover, these screens adds a traditional look when placed in your living room / drawing room. The Mango Wood 4-Panel Screen is crafted from hard wood and measures 20 inches wide and 70 inches tall. This piece will easily enhance existing decor in your Mediterranean or transitional styled home.Solidly built kiln dried wood panel frames. Attractive and durable wood panel shades. The lattice work looks great from the front . New wood designs are offered in 3 uniquely appealing “burnt” wood finishes. Rustic finishes compliment the extra hardy, indian style craftsmanship. Great for practical purposes like dividing a large space, as well as decorative purposes like creating a cozy nook for a reading chair and lamp table. Well built long lasting home furnishings as well as distinctive decorative accessories. 4-Panels. 20 in. W x 70 in. H (per panel)Our new open lattice design floor screen is part of a collection of traditional style wood frame Partition Screen. The panel frames are slightly heavier and more substantial than most designs, and the mdf panel shades are particularly durable. The open lattice work at the bottom adds an attractive design element, creating both an eye catching piece of furniture as well as an extra solid and durable folding screen. If you are unsure how you would like to divide your rooms, you can use the portable dividers and move them as you please. You can try several positions for the dividers, even several times per day, depending on your activities. You may even place the dividers in a closet when you don’t need them. 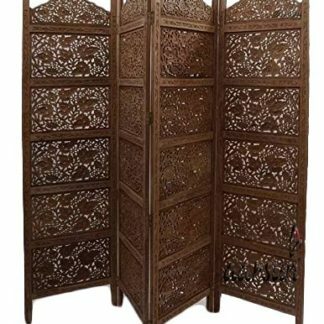 If you also like other wooden Partition Screen , have a look at Traditional Wooden Partition Screens,also in case you require fine carving in sheesham wood, go for Handmade Sheesham Wooden Room Dividers. I’m very pleased with my wooden screen from Aarsun Woods. It is just as described in the advert, and is a handsome piece of furniture that will grace any home. Many of my friends and guests have commented on how much they like it! This was a brand new item, recently made, and the wax polish finish was still not dry when it arrived. I got my man to buff the polish, and it looks very good. Packaging and delivery time were good, and a slight problem with the item was resolved very quickly by the seller.